Church bells across Bristol have rung out across the city to celebrate the 100th anniversary of the establishment of the university. 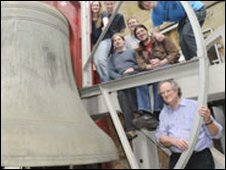 About 50 bell-ringers took part in the event which began at 1200 BST and started with "Great George" - the bell in the Wills Memorial Building tower. Other churches joined in after the first two minutes and the mass-bell ringing lasted for 45 minutes. The University of Bristol was granted its Royal Charter in May 1909. Professor David Clarke, deputy vice-chancellor at the university, said: "We hope the ringing of the bells will serve as a reminder that although the university is now a global player, it remains proud to be part and parcel of the city from which it grew." Churches taking part included Bristol Cathedral, St Mary Redcliffe and St Stephen The Martyr in the city centre. The university invited the public to join in the celebrations at the university's new centenary garden next to the Wills Memorial Building.